One of the things I like about the 4th of July is everyone getting together. When I was growing up we always had a family reunion which meant everyone brought their favorite food. Mine was always the cookies, brownies and desserts. What good memories I have of those family reunions . 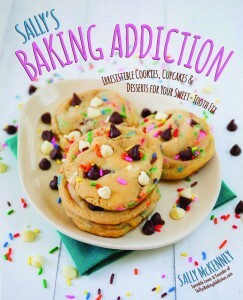 This book Sally’s Baking Addiction is loaded with 75 of Sally McKenney’s mouthwatering recipes! All things I would want to eat including Pretzel Peanut Butter Cups, White Chocolate Raspberry Cupcakes, Caramel Coffee Chocolate Chip Torte and many more wonderful sounding treats. The author Sally McKenney loves to bake and was named by Huffington Post as one of the Top 10 Food Blogs to Watch in 2013. Her famous Salted Caramel Dark Chocolate Cookies won Nestle¹s Dark Chocolate contest in 2013, and now, in her first cookbook, Sally shares her baking secrets with fans everywhere. I found a recipe that I thought would be perfect for the 4th of July. It is something you can enjoy with your family and I am sure your kids will love it and it is fast and easy! Some desserts are simply made to have fun while you eat. And this sweet Chex Mix® is a huge party in a bowl! Each cereal square tastes like funfetti cake, complete with a plethora of colorful sprinkles. I like to make this addicting little snack for every holiday, using different colored sprinkles. It takes minutes to throw together and even less time to gobble up! 1 Pour the cereal into a very large bowl. Set aside. 2 Melt the white chocolate chips and shortening together in a medium microwave-safe bowl in 30-second increments until melted, stirring well after each increment. Be sure to watch it carefully, as white chocolate tends to seize quickly within seconds. Once melted and smooth, pour it over the cereal, stirring very gently to coat. You do not want to break up the cereal. 3 Pour the sprinkles, dry cake mix, and confectioners’ sugar into a large zippedtop bag or large Tupperware® container. Add the cereal. Seal the bag or container and shake until all the cereal is coated with the powdered mixture. Discard any excess powder. Cover the snack mix and store at room temperature for up to 2 weeks. Purchase your copy today and bake some great memories with your family today.